Hi, has anyone got any ideas what the artifact in my images is. 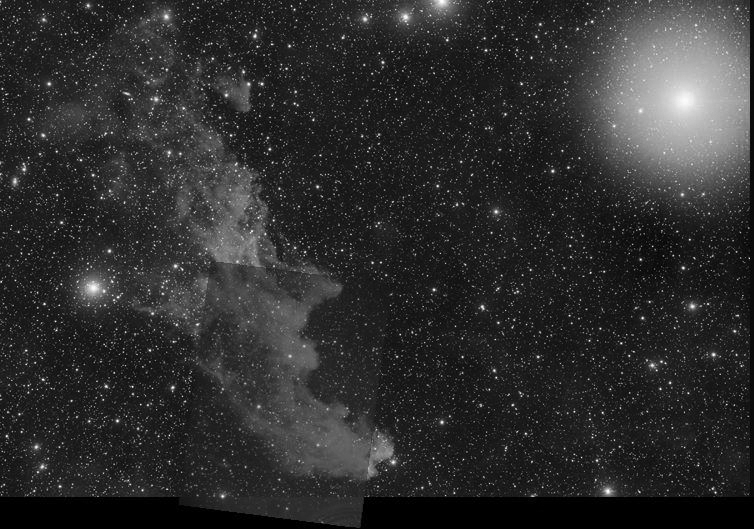 This time it has appeared in the top right corner pointing of the witches head nebula, if I point in the other direction it is in the top left, so is in the same spot, I think. 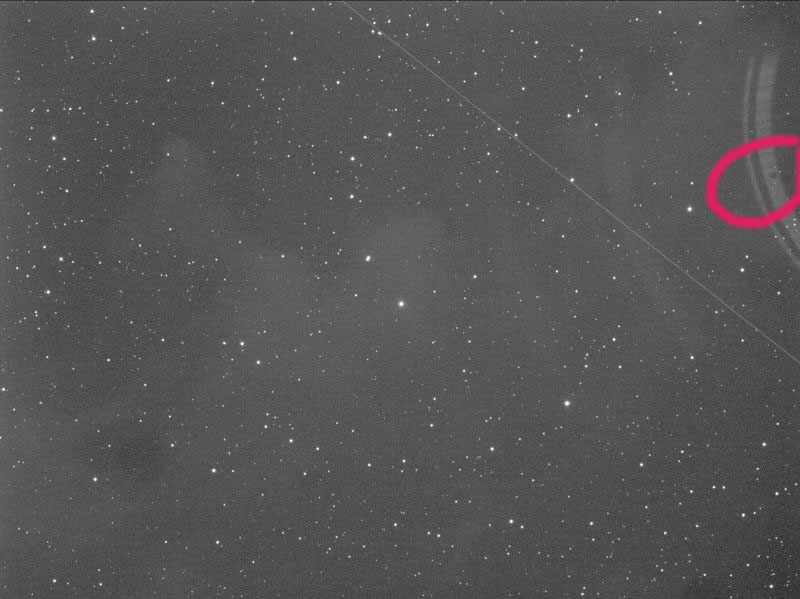 The thing is, it is not in all of my images and seems to only occur on long exposure when the scope is pointing high. Apart from dismantling my imaging train, I have checked for stray light, looked down the tube, etc. PS: I think PixInsight might flip the image, might be in the other orientation?? Reflections from Rigel? Is it always in the frame, regardless of where the scope is pointing or is it only in your Witches Head pictures? Hi, it is not in all of my images and only seems worse when the scope is pointed up nearer vertical. I'll have to pull the imaging train apart and have a look, it appears to be an internal reflection to me. So far I have replaced the focuser with a Feathertouch that is flat blacked and baffled, as is the tube(FLT132), I have removed the filters and blackened their edges as they are the 36 mm unmounted type, with no success. I did some testing after fitting everything back and found that it was still there although it looks different in different filters. I did also notice a black dot in the ring of the reflection that is consistent across different filters. Could it be a screw hole or something, could I use this as something to guide me in what to check for? If the reflection is different in different filters, what would that say about where the reflection is originating from- before the filters and after the focuser? I have a WO Adj. PFlatIV in front of the filter wheel, may be it is in there. It also only seems to be when the scope is pointing more upright, which might indicate something falling over or flicking out when it starts to get vertical. I was going to get a ladder up there and see if I could see down there with a torch. I would definitely appreciate anyone's thoughts. You have two separate issues to deal with. The artefact is a reflection of component(s) in the image path but the reflection is so far off centre that something is misaligned, the optical path is not collimated correctly. Has the problem been present since you began using the telescope or since you changed one of the components? Looking at the images you posted so far show a variable amount of tilt from virtually none in the first post to ~16% in the last, the stars in the lower left show tilt distortion quite clearly. Most likely this tilt is due to slop in the nosepiece fitting of the WO Adj.FlatIV when it is clamped in the FT focuser and the variability is down to the amount of tilt present as the attitude of the OTA is changed . 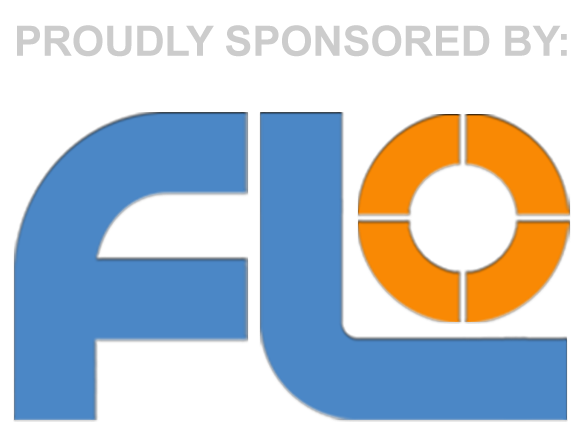 You may need to find a way to improve the rigidity of the clamping so that when the WO Adj.FlatIV is slid into the focuser draw tube it can not wiggle and tilt as the draw tube clamp screw is tightened. Try wrapping a piece of the very thin, transparent, flexible, hard-plastic packing foil that is used in supermarket food packaging, around the nosepiece barrel of the WO Adj.FlatIV as it slips into the focuser draw tube, so that it can not rock from side-to-side. You will have to experiment with different thicknesses of plastic (or other materials) to find a suitable thickness of material that can wrap a single complete turn of the WO Adj.FlatIV barrel so that it is held tightly and axially central to the focuser draw tube and cannot tilt as the clamping screw is tightened. You may find the draw tube of the FT focuser has adjuster screws either side of the central clamping screw (where it pushes against the brass compression ring) so that excessive slop can be taken up for whichever nosepiece is inserted into the draw tube. 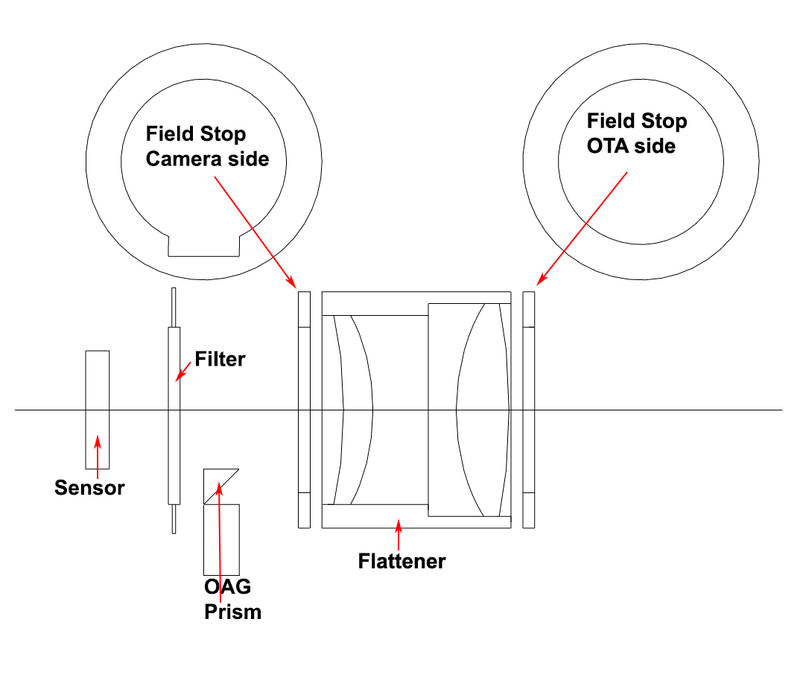 Note that when you use a wrapper around the nose barrel of the WO Adj.FlatIV then the safety undercut in the nosepiece is no longer able to secure the flattener, and the rest of the image chain, from falling out of the focuser draw tube so for safety a lanyard cord should be tied around the camera and filter wheel up to the tube rings with just enough slack so that the focuser can be moved into focus but the imaging equipment can not fall to the ground if the WO Adj.FlatIV slips out of the focuser draw tube during use. This 'sloppy' fit of the WO Adj.FlatIV in the focuser draw tube is not uncommon as the fit tolerances for the 'standard' 2" focuser vary so much between manufacturers and the larger dedicated WO flatteners that screw directly to the threads on the standard WO focuser are a better solution however since you have invested in the Feather Touch then adding packing around the flattener nosepiece is the only simple remedy and is one that I have used in the past. Both hard plastic packaging foil and self-adhesive copper foil work well (available from garden centres and used to stop slugs and snails climbing plant containers, or from electronic component suppliers and used to repair printed circuit boards). Once the reflection artefact is centred then the source of the reflection can be located. If you look carefully you can see that the 'artefact' actually covers almost half the image. This may be multiple reflections between the filters and the flattener or it may be an image of the OTA baffles, either way, the next step is to put the image system into its basic configuration. Remove the flattener and couple the camera directly to the telescope. Ignore the coma , is the artefact still there? If the artefact has disappeared with the flattener removed then you can be sure the artefact is due to refections between the filters and the flattener, or flattener and sensor, I can't remember if the WO Adj.FlatIV is just black anodised or painted with non-reflective black paint. If black anodised you may need to overpaint any visible metal surfaces with blackboard paint or high-temperature mat-black BBQ paint (pigment based paint). If the artefact is still there with the flattener removed then it will be more of a problem to pin down the cause as it could be a reflection between the filter and the prime objective or between the filter and the camera sensor. If the artefact is still present with the flattener removed try taking out one of the filters from the carousel and image through the empty slot, is the artefact still there? Check the unmounted filters are inserted into the carousel pointing in the right direction, some manufacturers have an arrow, or some other marker, on the edge of the filter that shows the side that should point towards the sky. 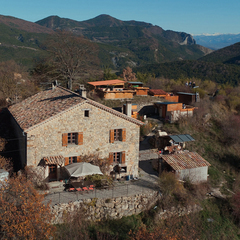 If the filters are mounted facing the wrong way round then strong reflections can occur between the camera sensor and the filter, or, between the filter and flattener. The fact that the reflections are slightly different between filters may be that some are pointing the 'right' way and some are pointing the 'wrong' way. Check also that the filters are sitting flat in the carousel and can not move or tilt, additional spacers may be needed beneath the filters where they sit in the carousel recesses, you would need to refer to your filter wheel manufacturers handbook and the filter thickness of the filter type you are using to determine if additional spacers are needed, the filters should be held firmly in the carousel and not be slightly loose or able to lift/tilt. Which camera and filter wheel are you using? I read on the Diffraction Limited forum recently that one of their SBIG camera - FW - filter packages left the production line with a bare metal base plate between camera and FW, it was missing the black anodising stage and causing reflections inside the camera. Double check by visually inspecting all the components in the optical path that all metal surfaces are correctly blackened and that no bare metal is visible anywhere. Hopefully the above will give you a few things to eliminate from the process of identifying possible sources of the artefact. I borrowed my friend Tom O'Donoghue's Witch Head in greyscale at very low resolution (I don't think he'll mind) and dropped your image onto it. William is SGL's expert on this kind of thing so the combined image might be helpful to him. I must admit that it leaves me a bit stumped. To be honest, I cannot remember when this first started. I have tried to think back and I can only say maybe since I replaced the QHY filters with the Baader ones. The two shots, L & G were taken straight after each other, both were guided 5 min sub frames. Is that enough to allow the camera setup inc flattener to move? Or could it be that one of the filters is not sitting square. Ive recently had them all out to check them. I have a straight nose piece that I have used previously with no issues so I will change to that and add a tether, also something else I have done previously. I have pulled the flattener out and I am waiting for decent skies to do some testing. I can see into the flattener and while the "through" surface is a flat grey (I would not say black) the inside barrel is anodised and is highly reflective and appears to give a rflection of the "through" barrel. If testing without the flattener is fruitful, I will have to find a way to dis-assemble the flattener to paint it or flock it some how. That sounds a logical next step in the process, thank you. I am not able to find any arrows on the filters or any marks saying which way round the go. I have used good lighting and a magnifying glass. I searched online and it said for the Baader filters, if there is no arrow, the most reflective side goes to the scope, the other side to the camera. I will double check this. I am using a QHY9 Camera and a QHY ultra slim filter wheel with a QHY OAG and QHY5LII guide cam. Thank you William for your thoughts and suggestions. I hope I can get it sorted soon. Thank you Olly for the image. I think at this stage, and I am hoping, that the issue is a reflection bouncing inside the flattener off the shiny black anodising. That may explain where it is showing up. Awaiting better skies, as always! There is a specific adapter that allows you to screw in the FlatIV directly to the focuser. Assuming the Feathertouch was bought with the same screw fitting (M92 I think) then this would give you the most secure way of attaching the telescope to the reducer. Thanks Whirlwind, my F/Touch came with the adapter to make it the same size as a WO end so I will sus this out! I too am looking into this adaptor (thanks for the link Whirlwind). I seem to recall that when my FT focuser for the FLT 98 arrived, I had to remove the focus tube adaptor from the original WO focus tube and screw it onto the bare FT thread - if this is correct then this adaptor would be a good idea for you and I might also consider it for myself. My current solution has been to remove the wax from the 'third' retaining bolt (actually a nylon grub screw) on the 2" adaptor and press the FR IV hard and flat onto the end of the 2" adaptor with one hand while tightening up the grub screw with a flat bladed screwdriver before finally tightening the two thumb screws. This gives me a tilt-free connection and excellent star shapes in the corners of the field of view but I do like the idea of an all screw fit connection. Had the problem with the floppy reducer flattener and bought one of these, bit of an expensive solution, holds it solidly but still needs tightening with a strap wrench and also tape wrapped the F/F to level the under cut. I hope I can get it sorted soon. A couple of extra points to check. Look at the central spindle in the filter wheel and make sure that the carousel is tightly held. The carousel should turn easily but should not appear ‘floppy’, for want of a better description. The carousel should hold the filters perfectly perpendicular to the optical axis, if the carousel is loose on it’s spindle this would shift any internal reflections from the filters off to one side and of course the position of any reflections would be highly variable depending on the tilt of the carousel under different OTA attitudes. Thanks for all the info. I appreciate the feedback, links and advice, all good stuff! The sky magically cleared last night so I spent a few hours testing, swapping bits, etc. It is the flattener. If I put a tube in the imaging train where the flattener was, hey presto, no reflections. Refit the flattener, hello artifact, welcome back! I tested without the flattener, with the flattener and then without again on the same two objects that had been giving me trouble to ensure I had reasonably consistent results. I will try to photograph the flattener and the issue I think it is before I pull it apart and paint it inside and retest it. I am at work at the moment so I shall try to do that tonight. William, are either of these suitable? I was thinking the Dulux Duramax by the cap colour? Looking at the specs the Dulux Duramax High Heat seems the best choice as it is described as a “flat finish” and should dry mat, the White Knight product is described as “Low Sheen” which sounds more like a satin semi-gloss finish when dry. The Dulux is self priming too and should cling to an anodised surface but do wipe the metal first with acetone (nail polish remover) as sometimes manufacturers use carnauba wax as a sealant for the anodising dye and that remains in the pores of the anodised surface only to leach out when you apply the solvent based paint and weaken the adhesion. Watch out though not to spill or apply any acetone to plastic parts, strictly anodised metal only! Bunnings also stock a mat black chalkboard paint which works just as well though it is not self priming and is not so ‘clingy’ to plain un-primed anodised surfaces. Both the high temp BBQ paint and the Chalkboard paint are good suppressors of unwanted reflections in the visible and IR wavelengths, for our use in optical equipment the only real difference is the high temp paint has a harder surface that is difficult to scratch so it is good for removable items that get handled a lot such as eyepiece barrels, barlows etc and the less expensive Chalkboard paint is good for telescope OTA’s, focuser barrels, filter holders and parts that are handled rarely. I hope the reflection problem does prove to be from the anodised metal surfaces of the flattener since this is relatively easy to fix, more often it is due to back reflections from the highly reflective rejection filters and the rear glass element of the flattener where the flattener is ahead of the filters in the light path. Even though the flattener glass is treated to make it low reflectivity some light is still reflected back. In an ideal world the filters and OAG would be ahead of the flattener in the light path but this is not so easy to achieve and not suffer vignetting or flattener to sensor spacing problems. I think the Dulux Dura Max will be the best. As for the painting itself, I have prepsol to clean the surfaces and yes, painting it with the spray can would be suicide. I am aware that replacing the flattener changes the focus point of the scope with the tube setup moving the focuser out which could possibly change where a reflection from something else might hit although I am sure that once you see the flattener internals it will be very easy to match up the off axis reflection with the components inside the flattener. Seeing the dot in the two images gave a pretty good hint once I looked in the flattener. Oh well, onward and upwards! It's designed for a camera lens but works just as well for the flattener as the reducer uses a similar camera lens movement system. It effectively works like an azimuth adjuster on your mount and provides the opportunity to be much more precise with your fine tuning. There's an image below as it is set up on my FLT98. Thanks everyone for your help. As it stands today, I am defeated! William was right, I fear. 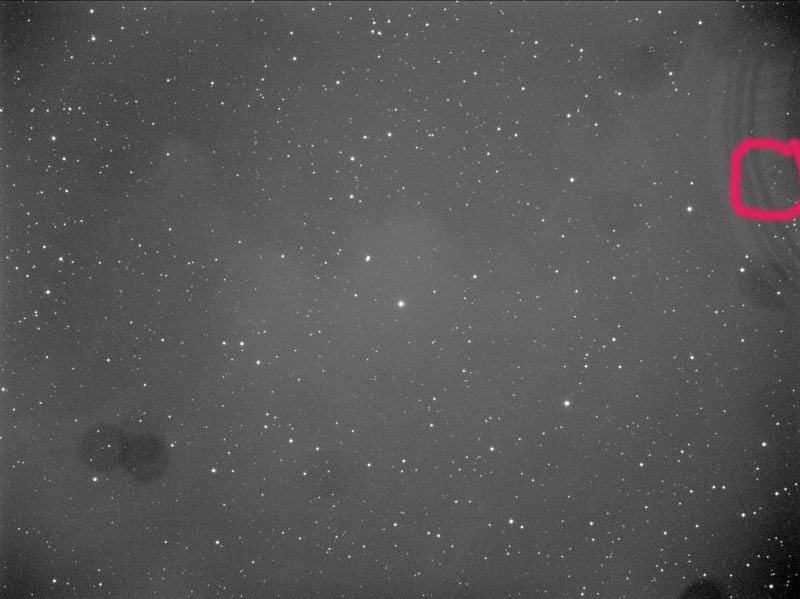 After all the messing about and travel time as my obs is remote (120km round trip), I think I must concede that it is a reflection between the flattener and the filters. Nothing that I have done has changed anything except to remove the flattener. I have tried with no filter, which works as well, turning the filters around, painting the inside of the flattener and replacing the focuser among other things. I have another full frame flattener, a TS 2.5 inch that I will have to get some adapters made for so I can fit and test. At this stage, it will be imaging with out a flattener as I see no reason to persist. 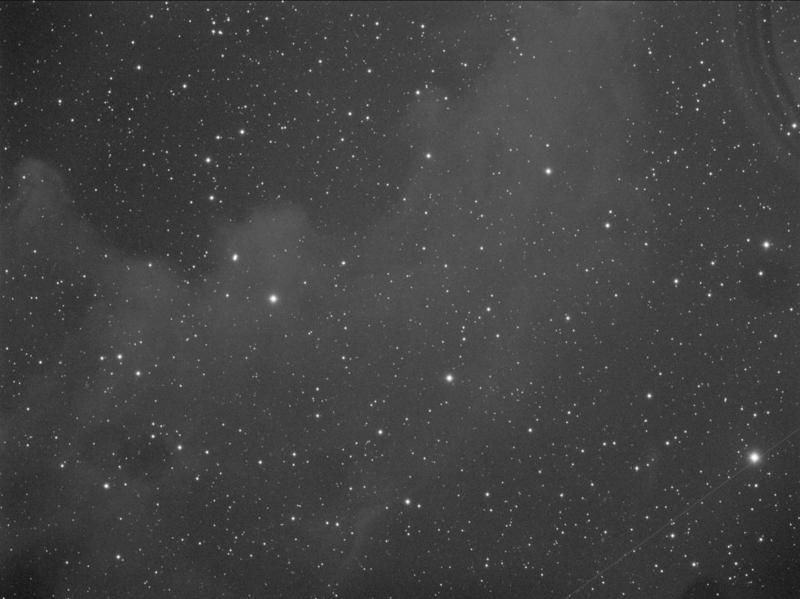 That will require a guider recal and possibly longer guide exposures to pick up guide stars as I notice the flattener can really help to resolve guide stars for OAG usage. If you are sure that the artefact is a reflection of the flattener mechanical internals you may be able to kill the reflection at source by placing field stops externally on either side of the flattener as in the attached image. For trial use artists black mounting board or plain thick cardboard painted matt black to create the field stops. Cut the field stop from the card using a compass cutter or gasket cutter, if you have one, otherwise a craft knife and scissors. The width of the field stop shoulders should be enough to obscure the flattener internal parts while leaving the optical path as clear as possible. You may need to cut a notch in the field stop closest to the OAG to avoid losing too much field of view for the guide camera. Temporarily take out one of the filters and rotate the empty slot into the optical path then look down the OTA from the prime objective end, use a torch to illuminate the camera sensor and flattener and look at the camera sensor from the edges of the prime objective, this will give you a clue how wide you can make the shoulders of the field stops so that the sensor is not obscured but as much as possible of the flattener internals are hidden behind the stops. The field stop closest the prime objective will have a narrower shoulder than the one nearest the camera. For testing fix the field stops in place with tape or blu-tack, magic putty...etc. If testing is successful fix the field stops in place semi-permanently with a few dabs of rubber cement (bicycle puncture repair outfit) or other soft adhesive that won't leave marks on the metalwork when it is time to remove them. If you want to be really accurate you can make a scaled ray drawing of the OTA and optical components and calculate the maximum sizes for the field stops but TBH the by-eye method is good enough, the worst that will happen if you are oversize is there will be slightly more vignetting or a little cut-off at the image edges, if undersize the reflection artefact may remain. Cardboard field stops will last years, the card just needs to be thick enough not to warp over time. I have made several over the years for different optical systems though once we had the right size in card we usually machined something more permanent in metal or plastic. One of my fellow club astronomers has recently made a snap-in set in black ABS on a 3D printer, attaching the stops to the focuser barrel on one side and flattener-filter wheel coupler on the other. Wow, when Olly said you were the expert on this, he was not kidding! Thank you so much for all your effort so far. I will certainly give that a try and report back with my results. Seeing as the weather is so hot and guiding is poor due to the wobbly sky, it is the right time of year to do this. It is going to be 43 here tomorrow, it is 36 today. Glad I'm not missing out on too much! I think Olly is over-rating my abilities somewhat! Still, it’s appreciated. I’m retired now but spent almost my entire career working with imaging systems. 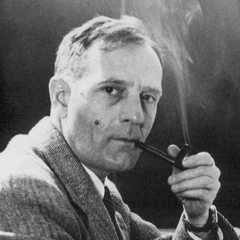 Although not the same discipline as astronomy, many of the optical components I worked with share similar design principles and the knowledge gained is useful when dealing with telescope problems. Most of these problems are solvable, eventually, though not so easy and rather time consuming when your observatory is remote from where you work and live. Your modesty is a virtue, William. I have not fitted the field stops at this stage, I am a little bit over the battle at the moment, so I've decided to capture a few images with what I have for the moment and digest all that has come to pass. In doing so, I have been contemplating the new flattener that I have aside for the scope and was thinking about back focus distances which got me to thinking about my current setup. Can someone interpret the specs on this page for the Flat IV particularly the recommended lens to chip distance and back focus recommendations. I take it that the 66-86 mean the numbers on the flattener adjustment and the back focus is the distance from the chip to the back of the flattener? Can﻿ someone interpret the specs on this page for the Flat IV particularly the recommended lens to chip distance and ﻿back focus recommendations. The back of the Flat IV (the part that carries the T thread) is a fixed distance with respect to the sensor. The calibrated scale numbers around the barrel are the distance in mm from the rear of the movable glass element inside the flattener to the sensor, assuming that the distance from the shoulder of the T thread on the Flat IV to the sensor is the standard 55mm for a Canon DSLR. It’s not easy to describe the Flat IV, it would have been so much simpler if WO had bothered to provide a manual or a drawing. The way that WO intended the Flat IV to be used is with the T thread at the back of the Flat IV body screwed directly to a Canon T adaptor and attached to a Canon DSLR giving a standard 55mm distance between the shoulder of the T thread and the DSLR sensor, then, to accomodate a large range of different WO telescope focal ratios the Flat IV body is adjusted to move the internal flattener lens group nearer, or further from, the rear flattener T thread. Normally you would mount the Flat IV so that the shoulder of the T thread on the back of the Flat IV is 55mm from the camera sensor, then, adjust the body of the flattener so that the scale reads the actual BF between the sensor and the rear of the internal flattener lens group according to the WO published data for your particular telescope, i.e, for the FLT 132 set the flattener scale to read 71.5mm (+ 1/3 the thickness of the filters you use) while the distance from the shoulder of the T thread on the back of the flattener remains fixed at 55mm to the camera sensor. If you need a little more BF to accomodate the equipment you are attaching, FW, OAG, camera etc, and provided you can still reach the recommended total BF distance for your telescope then simply subtract anything over the 55mm standard BF distance from the recommended scale setting of the Flat IV. To explain, if you needed 60mm between the shoulder of the Flat IV T thread and the camera sensor to fit all the equipment in then subtract 55mm standard assumed BF from the actual used BF of 60mm gives you 5mm over-length, subtract this from the recommended 71.5mm for your WO 132 gives you 66.5mm (plus 1/3 filter thickness) to set on the body scale of the Flat IV.